My latest tutorial is finally ready to be published. I had hoped that it would be on the website a couple of weeks ago, but all sorts of things have come in my way. The good news is that it has just gone into the shop. I will be very interested to see how this sells because it is my first intermediate tutorial. Although the instructions are detailed enough for a complete beginner to tackle, I feel that some prior experience of kumihimo would be adviseable and the end result would be better. 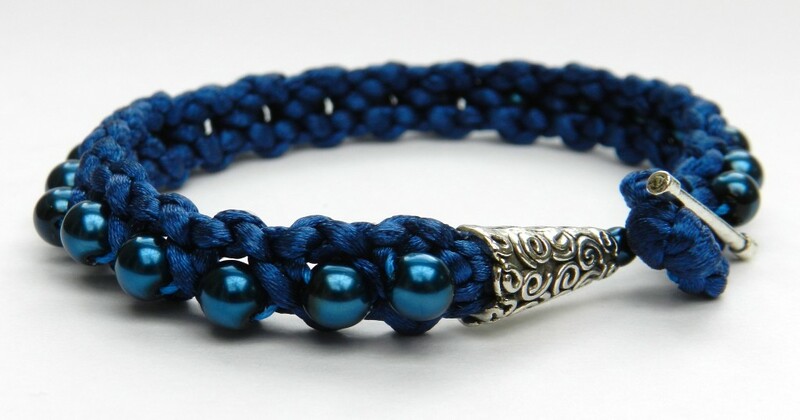 I hope that people heed my advice on the need to master the braid structure before embarking on the bracelet. All new braids seem a bit tricky at first, but the rhythm soon takes over and the braid becomes second nature. If you get up to speed on practise braids you will find that making up the bracelets is incredibly quick. I am looking forward to seeing the results! In the meantime, I will be making up a few as Christmas presents!